With endless choices of qualities, metals, and styles, shopping for jewellery can often be an overwhelming experience. Whether you need a ring for an engagement, the perfect accessory for a special occasion, or a unique gift for a loved one, our jewellery guides offer the information you need to identify quality in a jewellery piece and find the style that meets your taste and your budget. An engagement ring is one of the first-and biggest-purchases a couple will make, and it requires a great deal of research and planning. 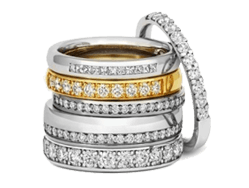 In our thorough Engagement Ring Guide, we provide all the information you need to find the ring that best suits your tastes and lifestyle. In addition to determining how much to spend on a diamond engagement ring, we'll also summarize the most popular metals, settings, and shapes. You'll also learn about the four key characteristics to look for when evaluating the appearance and value of a certified diamond. Before investing in a diamond ring or other precious gemstone ring, take the time to learn about the available options and the latest trends in the jewellery market. 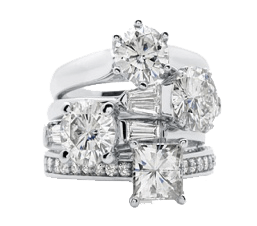 In our detailed Ring Guide, you'll receive insider advice on what to look for when shopping for an engagement ring, wedding band, promise ring, diamond solitaire ring or fashion gemstone ring. Our detailed guide outlines the most popular settings, styles, precious metal types, and colored gemstones used to make classic, contemporary, and trend-setting rings. From diamond-encrusted hoops to elegant studs, there are dozens of different earring styles available in today's fine jewellery market. 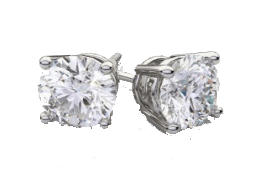 In our comprehensive Earring Guide, we'll explore some of the most popular fine earring styles, including classic hoop earrings, dangle drop earrings and versatile diamond stud earrings. We'll also help you narrow down your choice of gemstone, precious metal, type of backing, earring style and will provide helpful shopping tips for purchasing earrings as a jewellery gift. The right bracelet can add a polished, elegant finishing touch to any ensemble. Before purchasing a fine bracelet as a gift to yourself or a loved one, read our Bracelet Guide to learn about the most important things to consider. We'll explore the many types available, such as diamond bracelets, gemstone bracelets and precious metal bracelets, as well as modern styles like bangle bracelets and charm bracelets. Our guide makes your shopping process easier by providing some easy bracelet buying tips. Classic adornments for displaying pendants, gemstones or precious metals, necklaces are worn in almost all civilizations as a timeless jewellery piece. Our comprehensive Necklace & Pendant Guide helps you make an informed, confident buying decision. Whether you're looking for a diamond necklace, pearl necklace, gemstone necklace or metal link necklace, you'll find all of the information you need here. 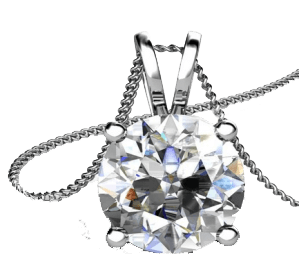 We also explore the various types of pendants, including solitaire diamond pendants, gemstone pendants, pearl pendants, and metal pendant and the most common necklace lengths.